NEW SQUARE TUBE FRAME VORTEX 4 BOW PONTOON/DECK BOAT BIMINI TOP 8' 91-96"
( COMPLETE KIT: FRAME, FABRIC, & HARDWARE ) | NEW SQUARE TUBE FRAME VORTEX 4 BOW PONTOON/DECK BOAT BIMINI TOP 8' 91-96"
WE ARE THE ONLY AUTHORIZED VORTEX MARINE DISTRIBUTOR ON EBAY. WE TAKE THIS VERY SERIOUSLY. 4. SHIPPING CHARGES ARE FAIR. THE SHIPPING CALCULATOR IS TIED DIRECTLY TO THE UPS SYSTEM. 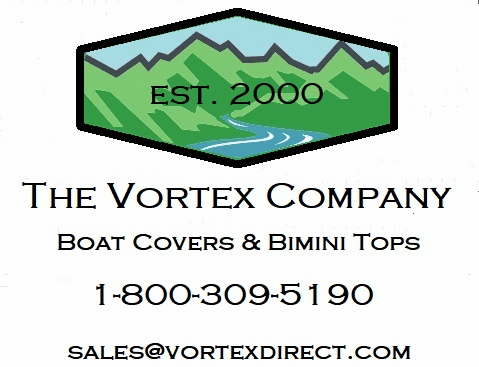 Vortex Bimini Tops are made with the best marine fabric available. It is the same fabric from which we have our covers made. The fabric is marine grade polyester that is treated and sealed in multiple ways. Specifically, it is double polyurethane coated on the bottom, or down side, as well as UV protected and mildew protected. Polyester and acrylic are very similar for bimini tops. Polyester has a very rich color and holds up to UV exposure very well. It also is very strong, resists stretching, retains it shape well. It has a very 'high end' look and feel, in addition to being quite heavy duty. Relative to acrylic, it is more water repellant and abrasian resistant. For bimini tops, polyester was cited as the 'best value' by the Boat Owners Association of the United States. Given all of this, we chose to have our tops and covers made from polyester. It is not just standard polyester, however, as it is marine grade polyester material that is double polyurethane coated, UV protected, and mildew protected, for extra durability and water proofing. The material is designed such that although it is extremely waterproof, water vapor can permeate it. This is not an issue normally for bimini tops, but for storage/mooring covers, it is very important. If polyester is the best material for covers, it is the best for a bimini top. In effect, it keeps water out, but lets water vapor escape, thus greatly decreasing the chances of mildew, mold, etc. The fabric is 600d, 600 denier, or 7.8 oz weight , making it a very heavy duty material. We use the same material for our boat covers as well, as it is simply the best value. To be fair about it, it is simply the best, even if you take the 'value' out of it. The point is that given all available materials for bimini tops and covers, this is the best choice, even if price were not a concern. As far as the support system/framework, it is made with 1" square tube anodized aluminum. Anodizing is just a process that increases corrosion resistance and wear resistance of a metal. Aluminum is a fantastic material for the framework of a bimini top. Then, it is treated to make it even better. The fittings and hardware are all heavy duty nylon and stainless steel(mounting screws hooks, and eye straps). The top is very strong. Please notice 2 extra things we add in as part of the deal. 1. One is the rear support poles that come with Vortex Bimini Tops. Many bimini tops come with 4 straps (2 for the front, and 2 for the rear).Ours are better. Our square tube biminis come with straps for the front, and support poles for the rear. This is normally a $40-$50 add on. The support poles add structural integrity to the top when it is up, given the inherent stronger nature of a metal pole vs a strap. This will also let you position the top in the 'radar' position, for easy deployment to full canopy. Or, if you prefer, use straps on front and back. That has it advantages also. 2. The other bonus we throw in is the storage boot. This is normally a $20-$40 add on, but we include it as part of the deal. It is great for storage and keeps the top safe from the elements, as well as neat and organized. It is just a simple tube that zips around the top when you are not using it. Please see pictures. As always, call us if you need help. We will be glad to help you. All of our bimini tops are 54" tall, which is standard for pontoon or deck type boats. This height generally gives ample headroom, but does not get tall enough that it is flimsy. With the bimini being 54" tall, and after you mount that to the top of rails that are normally 2 or 2 1/2 feet tall, you get a nice overall height of 6 1/2 to 7 feet..plenty of room to walk under for almost anyone! Then, determine the width of the top that you need. Measure from center to center across the rails where you want the bimini to mount. Vortex Square Tube Bimini Tops normally mount directly to the top of the rails pontoon boat, deck boats, really any boat! We generally recommend not to keep the Vortex bimin top 'up/extended' position, when not in use. 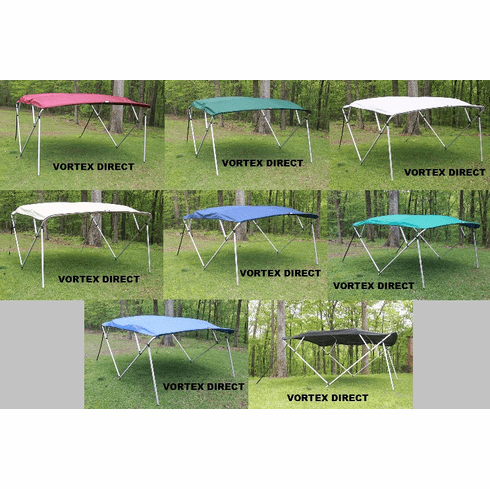 Vortex Bimini tops are extremely waterproof, so leaving them extended gives them the opportunity to collect water, and possible damage the railing due to excess weight. We recommend, when not in use, to store the bimini covered either in the 'radar' position, or collapsed position. This ensures no water collection, and greatly reduces the chances of damage. Damage resulting from excess water collection would not be a warranty issue. Instructions are included with the Vortex Bimini Top....1 page, front and back, with pictures...very easy..... Installation is very easy for anyone with even moderate handyman type skills. It is a very easy 2 person job, with very very basic hand tools. A cordless drill, tapemeasure, screwdriver, pencil, etc. It is a 1 to 2 hour job...maybe a little less with a helper. If you have any questions now, or during installation, don't hesitate to call us. Our experts are standing by, ready to assist you. This square tube bimini comes with a 5 year warranty on defects in materials, both for frame and for fabric.